Wolfgang Pichler has released a really cool open-sourced utility library to add a right-click contextual menu to a map developed with the Google Maps API. The contextual menu includes options to get directions, zoom in or out, center the map and find out 'What's here?'. In fact it mirrors very closely what you get if you right click on a map at maps.google.com. For more information, read through the reference and developer's guide. At the moment over 50 wildfires are raging in the Canadian province of Quebec. A number of the fires are active north of St. Lawrence Valley. 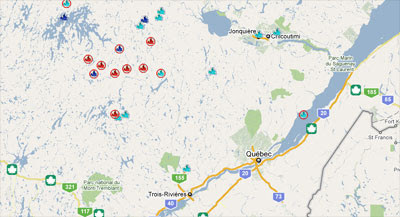 SOPFEU, Canada's forest fire protection society, has a Google Map that shows the active fires in the Quebec area. As well as showing the current location of the Quebec fires the map includes options to view a number of layers. The layers show where preventive measures are in force, areas where access is currently prohibited and areas where burning is banned. This Google Map from the Government of Ontario, Canada shows the ozone concentration measurements from Ontario's air monitoring stations. The map automatically shows the latest measurements but it is also possible to view the data for any hour in the last four years. A really nice feature of the map, and one I haven't seen on a Google Map mashup before, is the use of map insets. The map insets show in close up selected areas on the map. If you click on any of the mapped air monitoring stations you will be taken to the station's home page. Maposo is a collection of Google Maps satellite images that resemble household or well known objects. For example, the huge post-it note on the right was found in Thailand. The site uses an animated slideshow to display the images, so all you need to do is load the page and sit back and relax and watch as the images flow past. Left and right navigation buttons are also provided, so if you get bored you can fast forward or, if something catches your eye, you can navigate back to view it again. 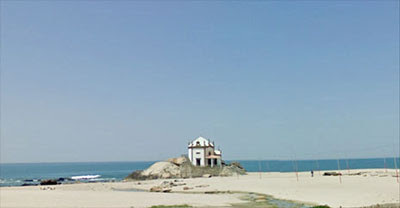 Currently Maposo has collected nearly 2,000 images from Google Maps. Oldmos is a Russian website of historical photographs of Moscow. 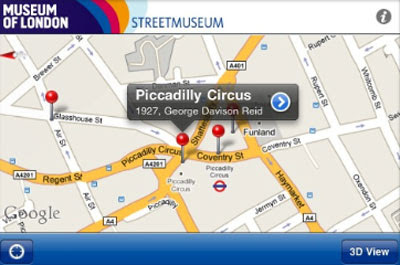 The home page of Oldmos features a prominent Google Map that shows the location of the historical photographs submitted to the site. You can pan and zoom the map to view the photographs from different locations. You can also use the slider below the map to select to view only photographs from a specific date range. As well as browsing the historical photographs by map you can also browse them by those recently added and those that are top rated. Vaarkaart Amsterdam is a Google Map designed to help you navigate the canals of Amsterdam. The site includes up-to-date information on locks, bridges and sections of canal that are currently shut for construction work or repairs. The map also shows the location of Amsterdam's marinas, gas stations, slipways and charging stations. Vaarkaart Amsterdam has usefully mapped all the bridges on the canal network. As well as providing Street Views of all the bridges the map shows the bridge heights and the canal depths. Finally, Vaarkaart Amsterdam has mapped the routes of a number of tours that you can take on its canal system. The tours include routes to see the best of the Western Isles, the Wallen district, the Plantage area and South Amsterdam. Vaarkaart Amsterdam was created using the Geostart Google Maps creation tool. Since August 2008, the Free Gaza Movement has sailed a number of voyages to Gaza. Today the latest voyage was intercepted by the Israeli navy. The WitnessGAZA website has been tracking the progress of the flotilla as it travels across the Mediterranean Sea using Google Maps. The interception point has been marked on the map with a red map marker. As well as the Google Map used to track the flotilla the WitnessGAZA website includes embedded videos taken during the voyage. Tragically when Israeli commandos boarded the Free Gaza Flotilla overnight more than 10 people were killed. Israel says its soldiers were shot at and attacked with bars and knives. Audrey Bomse, a spokesperson for the Free Gaza Movement says there was "absolutely no evidence of live fire" from the flotilla. This Google Map shows the GCSE exam results for 4,000 schools in England.If you click on any of the schools mapped you can view the average uncapped GCSE and equivalent point score per pupil in the school. The buttons to the right of the map allow you to refine the schools shown on the map. You can refine the results to show the top performing or worst performing schools. This map is another example of a Google Maps API V3 map displaying data from a Fusion Tables layer. Version 3 of the Google Maps API has a Fusion Tables Layer class that allows you to create a Google Map from data held in a Google Fusion Table. 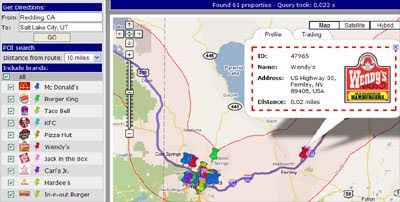 Map developers can use a Fusion Table to store location, line, polygon and associated data that they wish to display on a Google Map. Fusion Tables support an SQL like query language, which you can use to filter the features shown on a map. This means that a map developed from a Fusion Table can include some very powerful query features. Unfortunately at the moment there isn't any information or support for adding a Fusion Table Layer in the Google Maps API v3 Tutorial. So, with the help of Soren from microformats.dk, I've put together this short tutorial which I hope will at least get you started creating a simple map with a Fusion Table Layer and a number of functions to query the data shown on the map. To add a Fusion Table to your map you need to ensure that the Fusion Table is set to public or to unlisted. To do this click on the 'Share' button in Fusion Tables and set the 'Visibility Options' to 'Public' or 'Unlisted'. To get started creating your own map just copy and paste the html from any of the above maps and change the Fusion Table id number to the number of your own table. WikiPedia Articles - This example from ubilabs has the added bonus of using the new Styled Maps function as well as a Fusion Table. Probably the most powerful feature of the Fusion Tables Layer in Google Maps is the ability to query the data in your table and show the results on a Google Map. 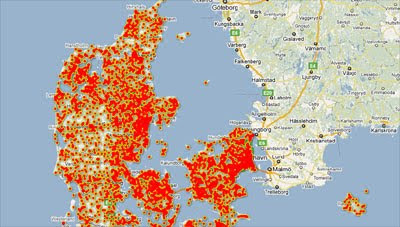 For example, have a look at this map of Public Library Funding in Denmark. 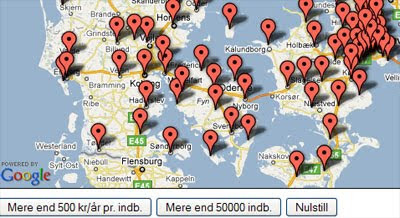 The buttons at the bottom of the map let you query the data to show only those areas that spend more than 500 kr a year and areas with more than 50,000 citizens. World Crime Rates - This example shows world crime and homicide rates. The map has included queries to view only countries with crime and homicide rates over certain figures. It is possible to add more than one condition to a query. This map includes a time-line that allows the user to choose to view map markers relevant to ten year periods. The query therefore needs two conditions. In the example below the function 'update' will load all the map markers that have a date bigger than 1900 and smaller than 1911. I hope that this very brief tutorial provides you with enough information to help you get started creating your own Google Maps from Fusion Tables. If you do create a map don't forget to submit the results to Google Maps Mania! Gee-map.com is a Dutch Google Map mashup that has a whole host of features. To start with the map includes the locations of thousands of points of interest around the world. You can access these points of interest by selecting ‘Lokaties NL’ for Dutch points of interest, 'Lokaties Overig' to select points of interest for other countries or 'Special' to browse by category. Alternatively you can click on the map anywhere in the world to access information about your chosen location. When you click on the map an information window opens with a number of tabs to give you a whole host of information about your selected location. If you click on the 'Algemeen' tab you will be given the full address of your selected location and links to YouTube videos, Wikipedia articles and Twitter messages around that area. The 'Weer' tab will reveal the weather for your chosen location. Selecting 'Route' allows you to get driving directions to your chosen location. The site also includes a fun Google Earth plug-in browser helicopter game. To fly a helicopter around any location in the world just click on the map and select the helicopter tab from the information window. Once you select 'helicopter' a Google Earth plug-in browser map will open of your selected location. You are now free to fly your helicopter at will. Oh, and did I mention you can also view Street View and Bing Maps Birds Eye View for any location (where available). 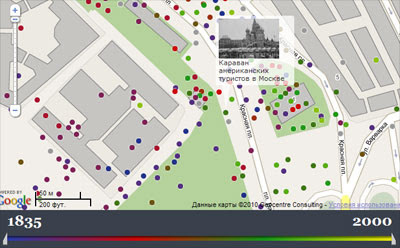 The city of Novosibirsk in Russia has released a real-time tracking Google Map for the city's bus network. Using the map it is possible to view the locations in real-time of all the city's buses. You can select to view buses on any individual bus line or select a combination of any lines. If you click on any of the displayed buses on a line you can view the schedule of when it will arrive at the stops on its route. There is also a mobile phone optimised version of the site so that you can see how far away the next bus is when you are actually standing at a bus-stop. 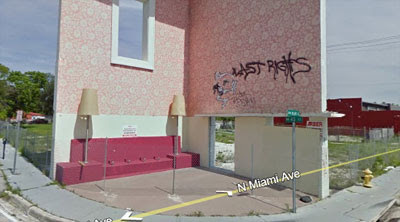 The climate in Miami is so nice that houses don't actually need outside walls or a roof. French website Culture Visuelle has put together a My Map of the locations of life-size sitting statues around the world. The statues are all of famous people and the collection includes the location of statues of John Lennon, Mark Twain and Abraham Lincoln, amongst many others. 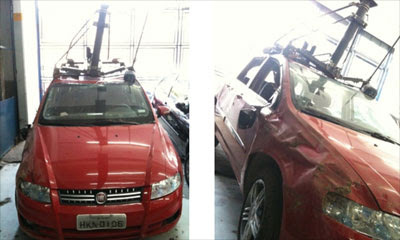 Google Discovery have a report of a car crash involving a Google Street View car and another car in Brazil. Apparently neither of the two drivers involved was hurt in the collision. Maptrot is another Google Maps creation tool that makes it very easy for anyone to create their own Google Map. 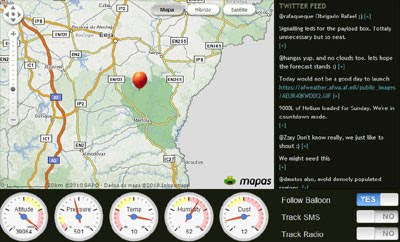 Maps created in Maptrot can be viewed on the Maptrot website or can be embedded in your own website of blog. Creating a map with Maptrot is a simple process. To add a location to a map you just click on the map and add a title and the information you want to appear in the marker window. You can also add different layers to your map by adding a KML or GeoRSS url. When a map is finished users can choose from three settings for their published map. If you select 'private' then you will be the only one who can view the map. If you select 'shared' then you can choose who can view your map. If you select 'published' then your map can be viewed by anyone. Plyce is the latest entrant into the location-based social network market. It is a market that is currently dominated by the likes of Foursquare, Brightkite and Gowalla. 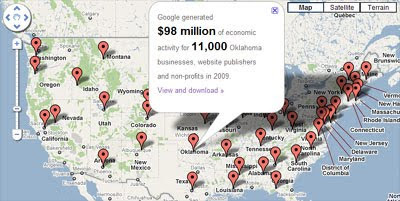 Plyce uses Google Maps for many of its featured networking options. With Plyce you can find where your friends currently are and see which of your friends are around your current location directly from the in-built Google Map. Plyce also lets you check for friends you have in common on Facebook with people around your location. So if someone in your immediate vicinity is friends with one of your friends they will show up on your map. This one degree of separation feature could just be Plyce's unique selling point and certainly could prove to be a great networking tool. Plyce also lets you check into and save your favourite places, gives you badges and has a weekly ranking table of users. Google Maps Mania favourite SafeRoadsMap is back with version 2.0 of their Fatality Analysis Reporting System. 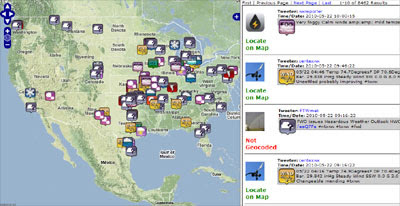 SafeRoadMaps use Google Maps to map every reported traffic accident in the USA. Using the map anyone in the United States can view the roads with the most fatal crashes in their neighborhood. 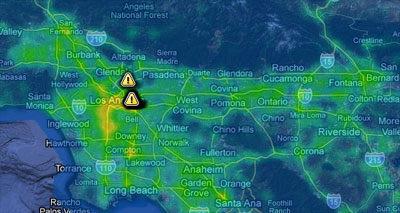 With version 2.0 of SafeRoadMaps users can also view heat maps of any location in the USA. The heat map shows the number of road fatalities using different colours, with blue indicating no fatalities and yellow a high concentration of accidents. As with version 1 you can still use the map to view the roads with the most fatal crashes in your area. Users can filter a search of accidents in their area by age and determine whether speeding, drinking or not wearing a seat belt was a factor in the fatality. It is also possible to use the maps to determine which states have aggressive driving laws, license suspension laws and seat belt enforcement laws. FindaSpring.com is a community and user created database of natural springs around the world. The site features a prominent Google Map which allows the user to search for a natural spring by location. If you know of a spring that is not on the map you can add it to the map. This morning I've been revisiting the Google Maps experiments on maps.forum.nu. This site has some great examples of what can be achieved with the Google Maps API. I particularly like these two Google Maps examples which could be very useful for anyone thinking of building a route planner with the Google Maps API. This route planning map can show you points of information along your route. So, for example, the map can show you all fast food outlets along your route. Alternatively you could build a map that showed all gas stations along a route. This is a cool experiment to show driving routes that lead to 30 miles around a given point. If you click on the map the map will load routes around that location that will take you 30 miles away. I can see a few practical applications for this experiment. If you used it in conjunction with walking directions or biking directions you could load suggested routes around a point. You could allow the user to define the route distance so, for example, you could show the user a number of ten mile bike rides or hikes around any given point. The University of Iowa has used Google Maps to create a number of flood inundation maps for Iowa. So far they have created maps for Iowa City, Waterloo and Charles City. Users of the map can use a slide-control to adjust the river’s flow and height and view the predicted flood effect directly on the map. The maps also include a risk calculator that allows you to calculate the risk of specific areas being flooded. Plane Finder is another live real-time flight tracker. 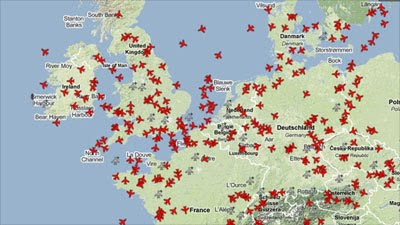 The site uses Google Maps to show the position of planes in flight over Europe, some areas of the USA, Turkey and sporadic coverage elsewhere. If you want to find out exactly where Plane Finder has flight coverage you can check out their Plane Coverage Map, which shows where the map is active. Like other flight trackers Plane Finder users plane shaped map markers to show the current position of planes. If you click on a marker you can view the plane's flight track and also information about the flight, destination and speed. 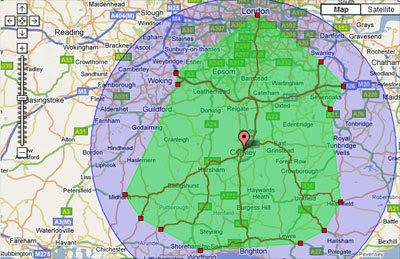 Map-Logic are using Google Maps to provide a number of free online Postcode Area and District boundary maps for Great Britain. 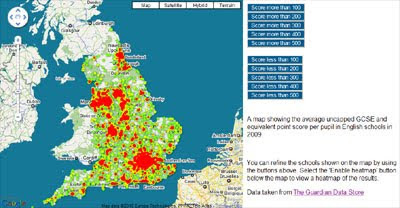 Users can view different region maps of Great Britain, view the extent of Postcode Districts in each region and click on the map to retrieve the district's postcode. Map-Logic say that at the moment they haven't worked out a way of showing all the labels for all Districts at the same time, so to retrieve a region's postcode you need to click the region on the map. Another omission is a search feature. It would be nice to be able to type in a postcode and be shown the relevant region on the map. This beautiful looking Google Map contains lots of information about what to see and do in the Brazilian cities of Rio de Janeiro and São Paulo. The points of information on the map can be filtered by eating & drinking, culture, leisure, shopping and nightclubs. Clicking on any of the map markers opens an information window with details and photographs of the selected establishment. Users of the map can vote each listed location 'up' or 'down'. 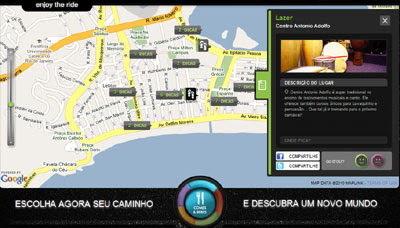 Users can even vote for which Brazilian city they would next like to see have its own Rider Google Map. The Museum of London have created a great iPhone application to showcase hundreds of images from its collections. You can use the included Google Map or use the iPhone's GPS to pinpoint your current location. You can then view images from the museum's collection that are in your vicinity. If you hold your iPhone up you can then look through the screen and see the historical image superimposed on the present day view. The Creative Review have been testing the applications' augmented reality function. They have some truly astonishing screenshots of historical photographs overlaid on the modern view as seen through an iPhone. This is probably the closest you will get to real time travelling until Dr Who drops in. This heat map of the world is color-coded by level of 'touristiness', based on analysis of photos on Panoramio. Yellow indicates high levels of tourism, red indicates medium tourism, and blue low tourism. Areas with no photos at all posted to Panoramio are grey. The map was produced by bluemoon.ee. This Google Map purports to show the world's most interesting remote places. Again the map has been produced by an analysis of photographs uploaded to Panoramio, this time with a little help from analysing city names with GeoNames. Yellow areas are very remote places with high tourism interest (e.g. Antarctica), green less so (e.g. mountains of New Zealand), and blue even less so (e.g. central Yucatan). 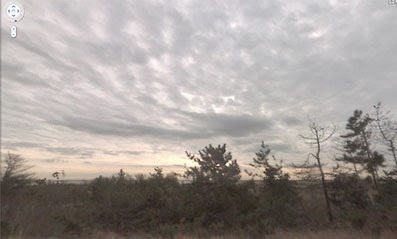 Grey areas have no Panoramio photos or are not remote at all (e.g. New York City). Again, the map was produced by bluemoon.ee. Google have open sourced the code of their Android live tracking app My Tracks. My Tracks enables you to record GPS tracks from your mobile phone and view live statistics – such as time, speed, distance, and elevation – while hiking, biking, running or participating in other outdoor activities. Once recorded, you can then view your track on Google Maps (Google have a number of samples of maps created with My Tracks here). So if you are planning to build a real-time tracking application for the Android market then a good place to start could be the My Tracks source code. In Borraccia! is an Italian campaign to reduce the consumption of plastic water bottles. As part of its campaign In Borraccia! is promoting these three Google Maps that promote the use of tap water over bottled water. This Google Maps mashup shows restaurants in Italy that serve tap water so you don't have to pay for expensive bottled water. The map includes quick links that help you zoom into different Italian regions. You can add the details of a restaurant that isn't already featured on the map. 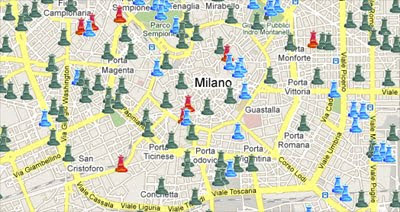 Mappa Fontanelle provides a Google Map of water fountains in Milan. The idea behind the map is that you will refill your water bottle rather than buy a new one. The site includes a Street View option so you can even check out the look of the water fountains online. In collaboration with local councils CAP are building facilities for the distribution of still and sparkling water via tap rather than by bottle. The facilities are being built in parks and green spaces. This Google Map shows the location of CAP's 'water houses' in Milan. We couldn't let the Lost finale pass by without a mention. It's been nearly six years since the show first aired so it is a bit surprising that we have only seen two attempts to map references from the enigmatic TV programme. However since one of those two maps is the excellent Washington Post's 'Lost Map' fans of the show should be satisfied. The Washington Post have used their excellent Google Maps time-line interface 'TimeSpace' to try and make sense of of the labyrinthine plot of the popular television programme 'Lost'. The map allows you to explore the show by year, location or season. The map markers include small summaries of the storyline and photographs of the show's stars. The information windows also contain links to episode explanations on Celebritology. There is an embed option that allows you to put the map in your own website and the option to link to the current map view. This Google My Map has four collaborators who have been tirelessly mapping references from Lost. Well, actually not that tirelessly, as the map hasn't been updated for a while. This is an interesting mashup of Google Maps and Flickr using the SIMILE Widgets Timeline component. 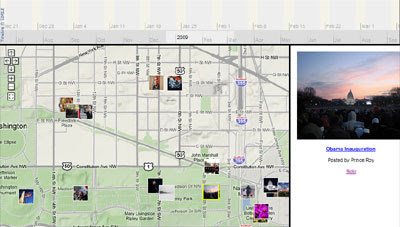 The map allows the user to view Flickr images for any location in the world. If you don't like the latest photographs for your location then you can use the time-line above the map to view Flickr photographs uploaded on different dates. This addition of the time-line means that you can search for photographs for particular locations on specific dates, such as Washington on the day of President Obama's inauguration or Greenwich Park on the day of the London Marathon. The Dealmap uses Google Maps to display all the best local deals, coupons and special offers. 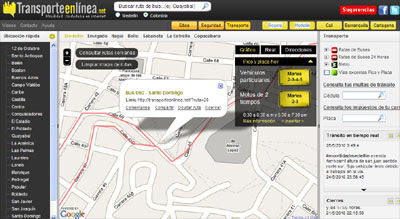 You can search the map by location and refine the results by a number of categories, including restaurants, shopping, hotels etc. The Dealmap displays a heat map to show where deals are available. If you zoom in or search for a location the deals in that area are displayed above the map. 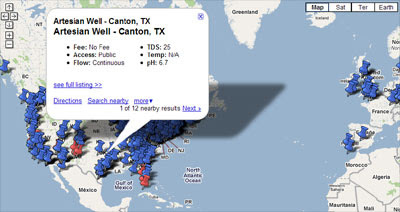 If you know of a deal that isn't on the map you can even add the details to Dealmap. You can follow Dealmap on Twitter, Facebook and a mobile app is coming soon .